SICStus Prolog IDE, also known as SPIDER, is an Eclipse-based development environment for SICStus with many powerful features. SPIDER was added in release 4.1 and is described on its own site, https://sicstus.sics.se/spider/. Code is highlighted based on semantic properties such as singleton variables, …. Predicate documentation is parsed on-the-fly and shown when the mouse is hovering over a call. This works for both built-in and user-defined predicates. Clicking on a called predicate can bring up its source code. Show callers and other references to a predicate or file. Show source code coverage, both as margin annotations and in various tabular forms. The predicates in a file are shown in an outline. They can be alphabetically sorted and non-exported predicates can be hidden from the outline. The debugger shows the names and values of variables. Backtrace is shown and there are buttons for common debugger actions (Step Over, Step Out, Redo, …). Source-linked debugging. Works also for code that has no recorded source info, like the SICStus library. The ordinary toplevel is still available, including the traditional debugger interface. SPIDER can attach to a SICStus runtime embedded in some other program. No need to reorganize your code, SPIDER can work with your existing folder structure. 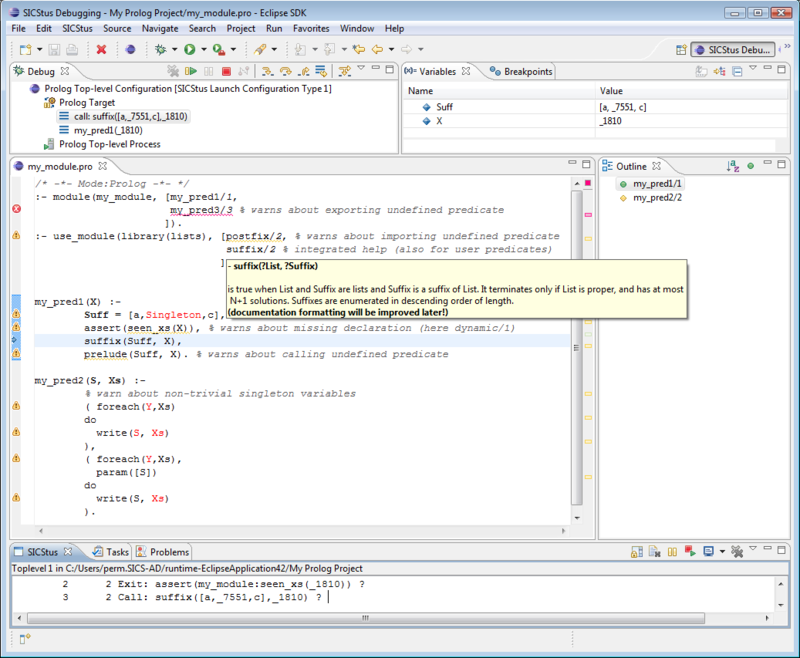 Eclipse provides many features for free, like support for other programming languages, revision control, and much more. Some of these features can be seen in the following screen shot.